Flow Hive on Indiegogo delivers honey on tap, making beekeeping easier for humans and bees. 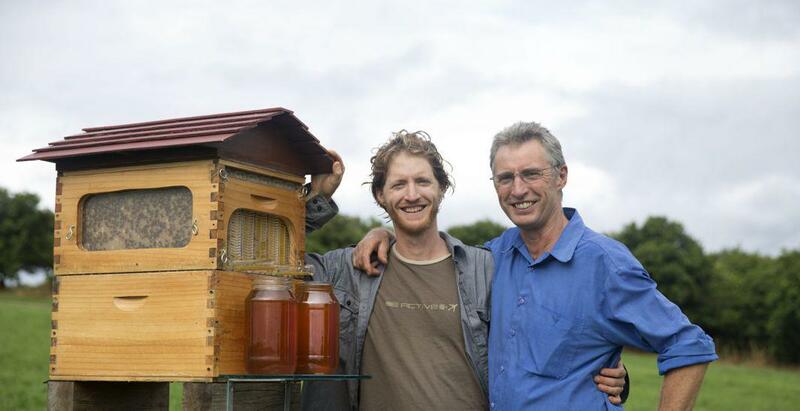 Cedar Anderson (left) and his father, Stuart Anderson, with their Flow Hive. Humans have been keeping bees for thousands of years. The process of extracting honey from hives has always been laborious, messy, time-consuming, and occasionally painful for beekeepers. It’s also a source of stress for bees that often switch to fight mode during a hive invasion. But a father-and-son team of second- and third-generation beekeepers from Byron Bay, Australia, has spent the last decade redesigning the beehive to make extracting honey painless for both beekeepers and bees. Cedar Anderson, 34, and Stuart Anderson, 60, have developed an innovative beekeeping system that provides honey on tap with no need to crack open and pull apart the hives. 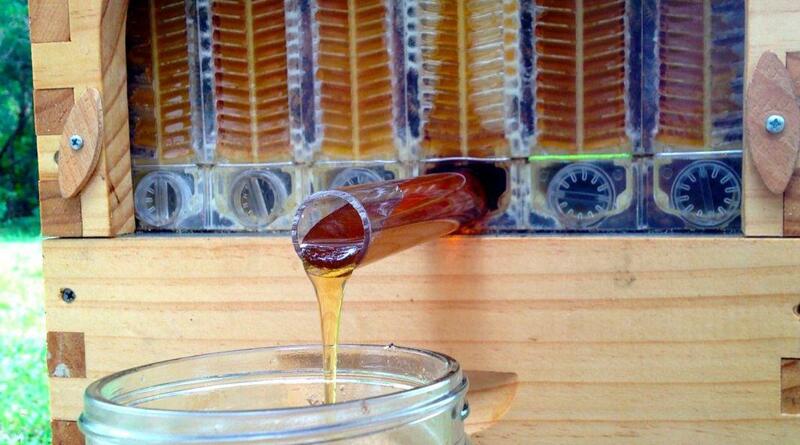 Flow Hive promises honey on tap without stings for beekeepers and stress for the bees. Harvesting honey typically requires beekeepers to gear up to protect themselves from stings, use smokers to sedate bees, crack the hives open, pull out honeycomb frames without squashing bees, move to processing facilities to uncap frames, insert them into extractors, filter out wax and dead bees, and clean up the mess before putting the frames back into the hives. The Andersons say in a press release that their invention marks the biggest shift in honey collection in more than 150 years, with enormous implications for both amateur and commercial beekeeping. The Flow Hive, they say, eliminates almost all required human labor and opens the potential for remotely activated or automated honey collection. Transparent frames allow beekeepers to monitor honey production and keep an eye on the bees. To create this seemingly seamless new method for harvesting honey, partially formed honeycomb cells are placed in transparent frames that fit into conventional beehives. The frames have clear ends that create viewing windows for beekeepers to monitor honey production, bee numbers, and pests. 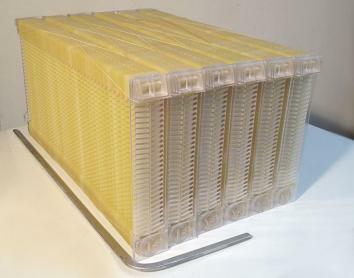 Flow Hive consists of partially formed honeycomb cells placed in transparent frames. Once the bees have completed the comb with their wax and filled cells with honey, the beekeeper inserts a lever into the frame, turning it to vertically split open the cells. While bees sit largely undisturbed on the comb surface, pure unfiltered honey discreetly drains down a pipe at the back of the hive and flows out through a tap. 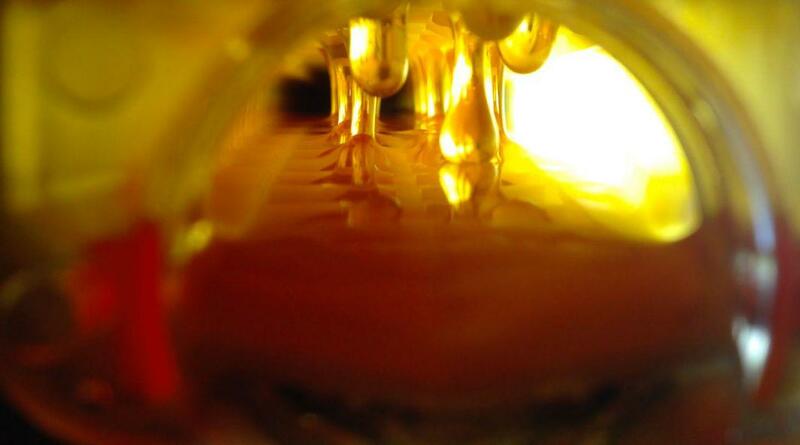 Once the honey has finished flowing, the lever turns back, and the process starts all over again. In addition to being well-funded budding entrepreneurs, the Andersons are beekeeping evangelists. To see the Flow Hive in action, check out the video below, or visit the Flow Hive Indigogo campaign or website for more information.